Architecture and construction has a unique language of its own. Please use this list of terms common to the design and construction industry to better understand and communicate with your architect. A characteristic by which the two sides of a facade or architectural floor plan of a building present mirror images of one another. 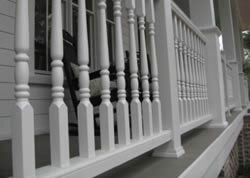 Vertical supports for a railing or balustrade. A narrow strip of wood or metal used to strengthen or fasten, such as a wall panel or board. 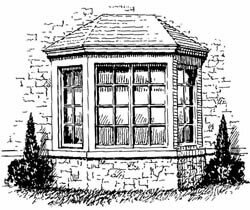 A bay window is a protruding window construction, with a flat front and angled sides. The part of the foundation wall where brick (veneer) will rest. Also referred to as a building skin, the building envelope is the physical separator between the interior and exterior of the building. The envelope includes things like walls, floors, roofs, fenestrations, and doors. A rounded edge on a surface or object. Typically seen in drywall corners, and countertop surface edges. A foundation type constructed by boring deep circular holes in the ground and filling with concrete. A projecting beam or other rigid structural member supported at only one fixed end. An exposed trim piece most commonly around a door or window. A beveled or rounded edge on a right angled corner. 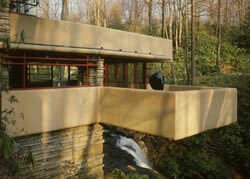 The application of one material over another to add an extra skin or layer to the building. It can be any material wood, metal, stone, vinyl, but the cladding must be waterproof because it’s primarily used to protect the building against leaking. An opening providing access to a drain line, closed with a threaded plug. 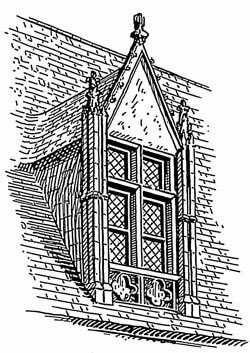 A window or series of windows that are set above eye level to allow for light and ventilation. 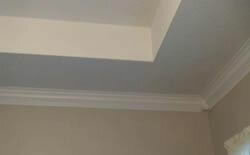 The interior portion of a ceiling in a room that is higher than the ceiling around the perimeter of the room. It’s purpose is decorative rather than structural. 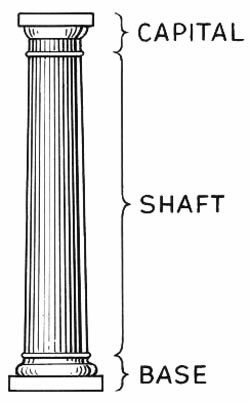 An upright pillar which is usually cylindrical in shape and made from a solid material. 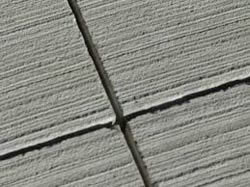 A joint in a concrete slab, or other finished wall materials, which is cut in regular intervals to allow and control cracking in the material. A molded projection that crowns a wall or divides it horizontally. A cross wall that stiffens the vertical slab and adds weight to the base. 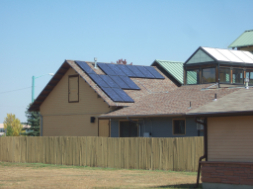 A ridge on a roof designed to divert water off of the roof. The curtain wall is typically defined as a thin, aluminum-framed wall that contains in-fills. The framing is attached to the building structure, so it doesn’t carry the floor or roof loads of the building. 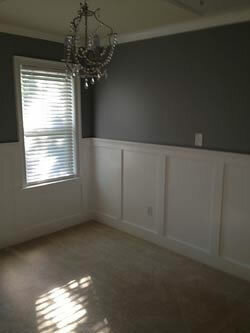 A wall that separates one unit from another, as in a townhome. 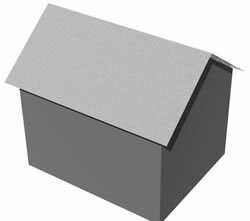 A protrusion from a sloped roof that can create usable space in the roof of a building. The lower overhanging portion of the roof. The act of pulling dirt out of an area to put in a basement or other foundation type of a house or other structure. An assembly that is designed to absorb the expansion/contraction of building materials, as well as allow movement due to settlement or earthquakes. The face of a building, most commonly referring to the face that fronts the main street. 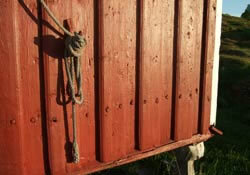 A wooden board or other flat piece of material that covers the ends of rafters. An impervious material that is installed to prevent water from entering into a structure. The duct through which smoke and other gases (from a gas heater for example) pass to exit the building. Typically made of concrete with rebar reinforcement that has been poured into an excavated trench. The purpose of the footings is to support the foundation and prevent settling. Footings are especially important in areas with troublesome soil (expansive or other). Any wall that is used to extend an existing wall for various reasons. Some examples would be to allow the installation of more insulation in the wall or at an exterior wall where you have plumbing, it allows you to not have to put the plumbing lines in the exterior wall where they could freeze. Thin strips of wood or another material applied to a stud or joist in order to form a level surface or create an air space. 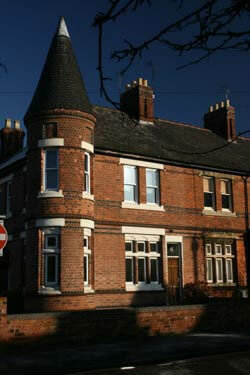 A roof sloping downward in two parts from a central ridge, as to form a gable at each end. The main horizontal structural support beam in a building system, different profiles are used to support smaller beams. The level at which the dirt is around a house or any structure. A part of a building’s foundation system made up of reinforced concrete that transfers loads into caissons or similar. 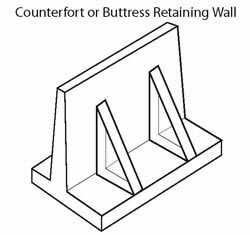 A structural member in a wall that creates support for an opening for a window or door (#4 in above image). 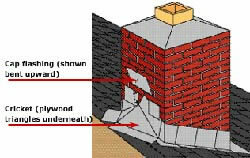 In brickwork, a header is a brick that is laid with the short side exposed. A roof with sloping ends and sides meeting at an inclined projecting angle. 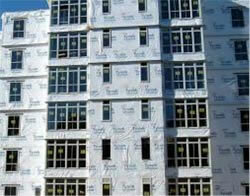 A synthetic material applied to the exterior sheathing of a building to produce a weather-resistant barrier. Tyvek is a common brand. A stud to the left or right of a window or door that is continuous from the bottom plate to the top plate. A wall that supports any vertical load in addition to it’s own weight, usually in reference to supporting the floor above it or the roof. A room or space directly under the roof of a house or other building, which may be used for accommodations or storage. 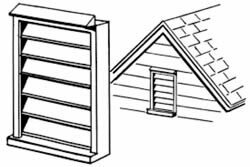 A series of flat slats that make up a shutter or screen that are installed at an angle to allow or disallow light and air to pass through. The general three dimensional shape, as well as form and size of a building. The framed out portions on a floor plan, usually about 12″, to allow ductwork from the furnace to get to the adjoining floors in order to heat or cool the space. Mullion: A vertical framing member that divides a series of windows or doorways. 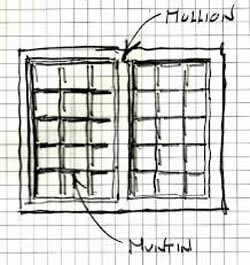 Muntin: Vertical and horizontal elements (usually made up of wood or metal) that separate and hold window/door panes within a sash. 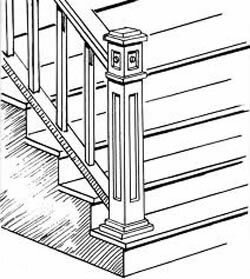 The upright post that supports the handrail of a staircase. Also known as flakeboard, sterling board and aspenite, is a type of engineered wood similar to particle board, formed by adding adhesives and then compressing layers of wood strands (flakes) in specific orientations. An exterior low wall along the edge of a roof or balcony. An interior wall that separates spaces, only supports its own weight, and is not used to support any other loads. 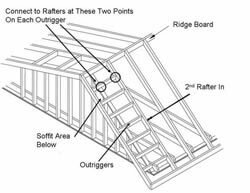 A sloped structural members that extend from the ridge or hip to the wall plate, and provides the spanning capability of the roof sheathing. A sloped or angled wall next to a stair that is used in residential design to open up a stair so that it doesn’t feel so closed off. 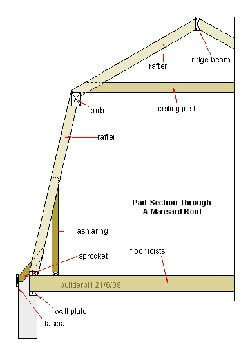 A are structural elements (such as a 2×6) that support rafters and transfer loads from the roof to walls. The vertical members that make up stairs. A vent installed on the roof to allow air to escape an attic space and to cool the attic in the summer also allowing moisture in the attic to evaporate. A brick laid horizontally with the short end exposed. 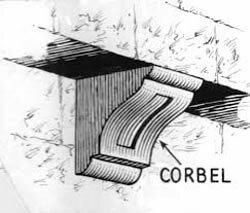 A structural wall (wood, concrete, or masonry) that resists the effects of lateral loads, such as wind or seismic, and transfers loads to the ground foundation. Plywood or OSB that covers the framing of a house or structure. It is usually used on wood frame construction at the exterior walls and used to cover the roof trusses but can be used in various parts of a house as well. Any roof with a single sloped surface. The bottom horizontal member of a wall or building to which vertical members are attached. Other names are ground plate, ground sill, groundsel, and midnight sill. Aconcrete slab, in conjunction with footings, that serves as the foundation for a home or building with no space between the floor and earth. A strip of wood anchored to the subflooring, allowing a place for the finish floor material to attach. The underside of a roof overhang that allows for venting, or a dropped soffit interior to a building that serves as a chase for mechanical or electrical chases or a ceiling treatment. A screened or perforated soffit that allows air to flow into the attic or the space below the roof sheathing. This helps keep the attic cool in the summer and allows moisture in the attic to evaporate. A brick laid vertically with the long narrow side exposed. Refers to the process of building a structure piece-by-piece or stud-by-stud (instead of pre-manufactured or pre-fabricated trusses), on the construction site. In brickwork, a brick laid horizontally with the long narrow face exposed. A structural element that supports the risers and treads of a stair. On the elevation of a house or structure where the stucco protrudes about 2″ or more from the face of the building. The stucco band is usually made by attaching foam board to the face of the building and covering it with stucco. 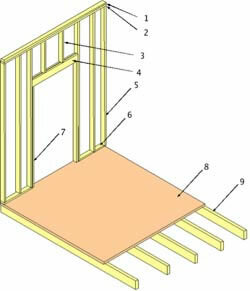 A wall stud is a vertical framing member in a building’s wall of smaller cross section than a post. They are a fundamental element in frame building. A pump, usually installed in your basement and where the low point of the grade happens to be, used to remove water that has accumulated in a water-collecting sump basin. The water is then pumped out to the outside to prevent the water from collecting underneath your house. The horizontal members of a stair. 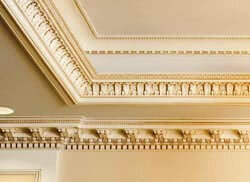 A stud to the left or right of a window or door that runs from the bottom plate to the underside of a lintel or header. A truss is the supporting structure or framework that’s composed of beams, girders or rod, usually made of steel of wood. Its shape usually looks like the triangle, as it’s the frame that supports the building’s roof. A smooth, hard material such as hardboard or plywood placed on top of a rough material, in order for a smooth finish floor tile to be laid. A water resistant layer of thin material placed under roofing materials. 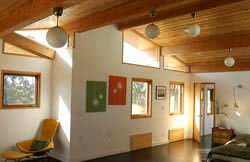 Any ceiling type, either sloped or raised, that creates volume by being higher than surrounding ceilings. A change in material where the lower part of the wall is of a different material than the top, can be applied to the interior or exterior. A walkout basement is most frequently found in houses situated on a slope, since part of the basement level is above ground – however a walkabout basement is most simply defined as a basement with full windows and a door to the outside. 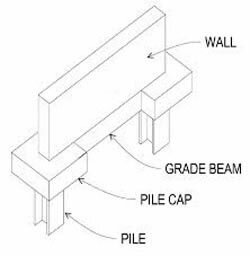 A piece of lumber or other material laid horizontally in or on a wall as a support for a girder, rafter, or joist.